Our adventure begins when we land in Dinard, France on May 24, 2011. 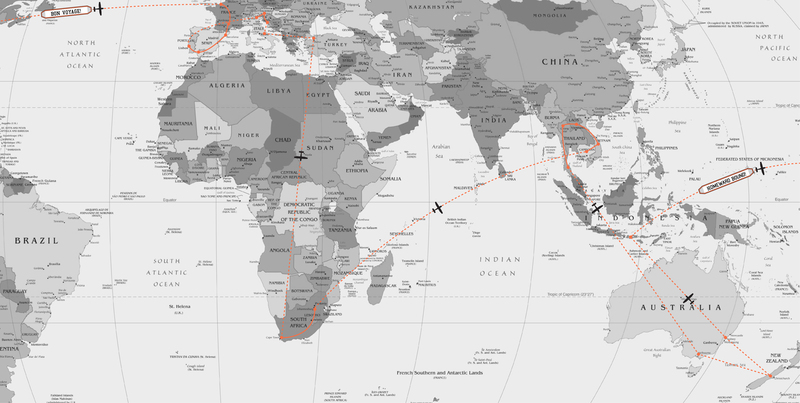 From there, we’ll be making our way across Europe, down to South Africa, over to Southeast Asia, down to Australia, over to New Zealand, up to Indonesia and finally back home to California. Depending on how we’re doing on our budget, our level of homesickness and Phish tour date announcements, we’ll probably be on the road anywhere from 10-12 months…if not indefinitely. Below are the countries and cities we are planning on visiting, in order, and the time period we think we may be in each. We’ve pre-booked some stuff like our farm and winery workstays and longer international flights, but the itinerary is largely up in the air. If you have any travel tips or suggestions (read: free places to crash) for any of our stops, let us know. Better yet, come visit! Lemme know if you need a place to stay in Italy – I have family in both the north (near Milan) and in the south in Sicily. If you make it to London, give my sister a call. She would love to have you stay with her! Hi Anna! I leave for Italy tomorrow, Sarah mentioned you might be in Italy when I get there. I am in Chianti for a month; I have family in the Venento region and near the Cinque Terre. So if you need more peeps in Italia let me know! Wish I could make it to Portugal! !